About this Model: The Submariner is Rolex’s most popular sports watch and has defined what the dive watch is since its introduction in 1953. 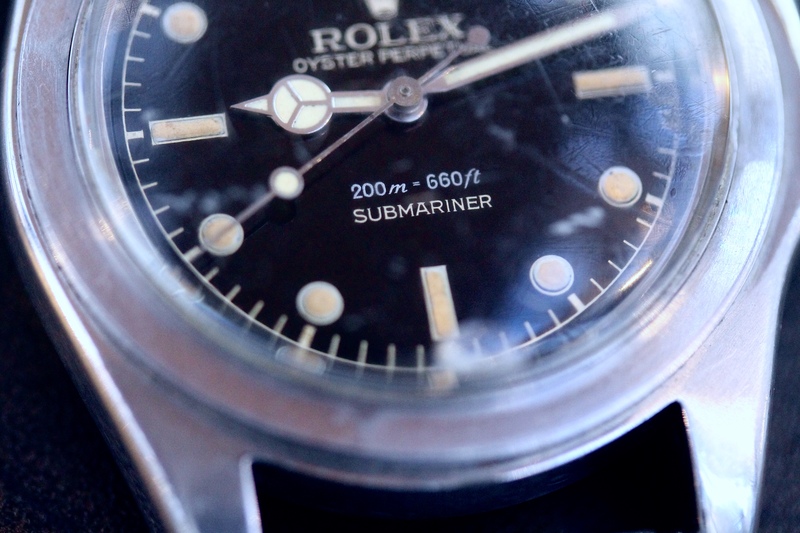 Like the GMT, the early models had a number of variations – crown size, depth rating, bezel style, and on and on. With the advent of the 5512 model in 1959 they added the much needed crown guards and settled on the specifications that are recognizable on the Submariner of today. About my Example: My Rolex 5512 is, unequivocally, the most personal watch in my collection. Given to me by a friend of the family in 2015, it was a watch that saw over 20 years of wear in the United States Marines. U.S. Marine Edwin W. was in Key West in 1960, having just completed his initial scuba training and about to be put on his first assignment. His mother drove from their house in Kentucky to see him and, while they were off base for some family time, wanted to buy him a gift. Having seen others in his unit buy dive watches for the tasks ahead, he decided that a Submariner would be useful as both a tool and a reminder of his family. He doesn’t remember the other models available when they walked into the AD but the 5512 was the newest, with the highest depth rating and crown guards, and his practical disposition led him to his choice. Over the next two decades, Edwin would wear the watch on missions in the Caribbean during the Missile Crisis – reconnoitering Cuban beaches – as well as training a generation of Marine scuba divers, completing over 120 parachute jumps, and making it through two tours of Vietnam. While the bezel got lost and the band broke twice, the watch never stopped. When he went on to be a minister, his watch, no longer matching his lifestyle or serving it’s prior purpose, went into his bedside table. It came to me without a bezel and with service hands, a cracked crystal, and the final broken replacement bracelet. It took some time, money, and a little bit of luck but I was able to source period correct parts and am happy to say that it’s restored to former glory. While this 5512 is not a great ‘collectors’ example as it has a polished case and cracked lacquer, the story and personal connection make it my favorite.